Fiesta is located at the Chowrasta Mall and straight ahead of the point where the Nehru Road meets the mall area. The restaurant is semi circular in shape as it occupies a corner of the Mall. f you are planning to watch the Mall activities and people passing by while you enjoy some snacks or food, then Fiesta can be a good choice. There is no other eatery right on the Mall other than cafes and tea lounges like CCD, Nathmulls etc. 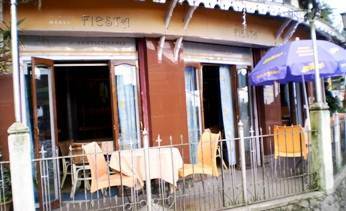 Fiesta serves South Indian, Chinese & Tibetan dishes and snacks. The entrance to the restaurant is from the Mall. There is a small outside patio on the ground floor where there are couple of tables with chairs laid out under large umbrellas. These are ideal for enjoying the Mall view. From inside, there is a door that opens out to the small patio. There are two floors on which the inside seating is organized. As you enter through the front door, a staircase leads to the upper mezzanine floor. 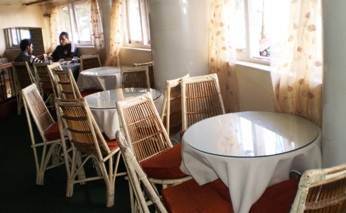 On both ground and upper floor, there are several round tables arranged along the window side. The windows open out to the Mall, so almost from all the tables you can watch the mall activities outside. The carpeted upper mezzanine floor looks a little crammed compared to the ground floor. The windows in the mezzanine floor are much smaller than the ground floor. There is a cash counter and a kitchen at the upper floor. So what kind of food do you get at the Fiesta? While the menu is not extensive, there are several choices. The restaurant other than regular items, also serves breakfast and snacks. You will get South Indian dishes like Idly, dosa & uttapam. Other than these they offer vegetarian and non-vegetarian momos, pizzas and sandwiches of different types. Some of the nice items to try here includes the Tibetan dish chicken thukpa or the veg thukpa. They also have regular Chinese soups in the menu. Vegetable spring roll is also quite nice. 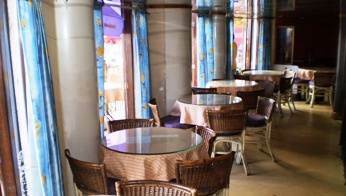 Fiesta also offers confectioneries, hot and cold beverages of various types including Darjeeling tea and fresh coffee. If you like organic tea, you can try the Tulsi masala, Tulsi ginger, original Tulsi or the Tulsi green tea. 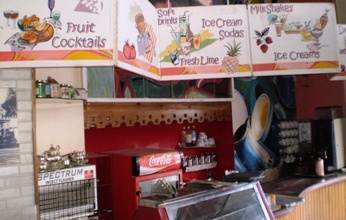 You will also get ice cream sundae, fruit cocktail with ice cream, banana split, milk shakes, fresh lime with soda, fruit juices etc. They also keep Coca Cola products. When I asked one of the staff what are the specialty or best dishes here, she said that they make South Indian dishes and momos really well. While the staff are friendly and cooperative, the service didn't seem to be great, which is often the case with many Darjeeling restaurants. They take it easy and take their own time to serve. Fiesta is located at the Chowrasta Mall and right opposite to the Cafe Coffee Day. 1) Check out Cheap Darjeeling Restaurants for the best budget eateries in the hill town.